You want to get futuristic looks for your Halloween costume, party setup, the inside of your vehicle or basically any decoration? Try the EL (Electro Luminescent) wire from LED Montreal. This 1 meter long illuminating string features 3 modes: always on, slow flash and fast flash. 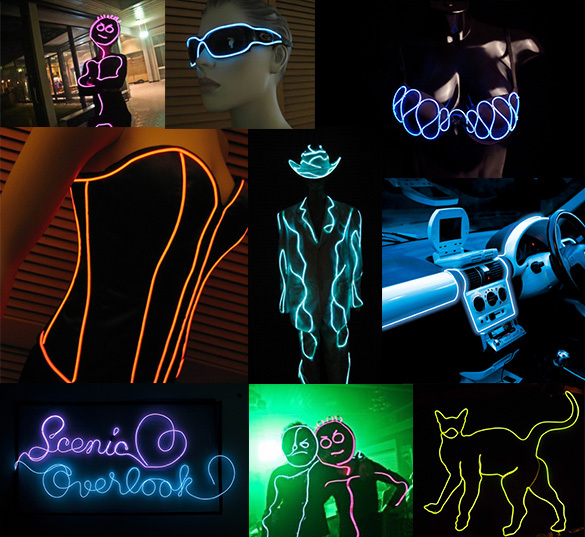 With its 2.3mm thick body, the EL wire is offered in 7 colors: red, white, blue, orange, lime green, dark green and pink. You can power it with a battery pack of 2XAA batteries or if you want it to last longer, you can also get the extended battery pack of 8XAA (Note that the batteries are not included). The battery pack may make a slight hissing noise when in use. This is due to the DC inverter and rest assured that the product is safe for the user. If you need the El wire for a permanent display, you can also connect it to a standard 120V outlet with the power adapter kit. The 1m El Wires have a connector on both sides, which allows you to attach them to one another. You can put up to 6m of these on the same circuit! Also, using a Y shape or 3-way splitter, you can send the El Wires in different directions. Need a little spacing between 2 of them? Add an EL extension cord! You can basically set it up however you want. Please note that for better results, you should try to balance your circuit as much as possible. For example, using a Y shape splitter, you shouldn’t put 5 on one side and 1 on the other. Also, for circuits that are more than 3m long, we suggest using the extended battery pack for more brightness and longer lasting activity. If you’re looking for different sizes or wire diameters, LED Montreal offers more EL wire options such as 3m 2.3mm EL Wire, 10m 2.3mm EL Wire and 3m 5mm EL Wire.